THE DRILL BIT: The best price is never the best value. The best price is never the best value. Here is a classic example. 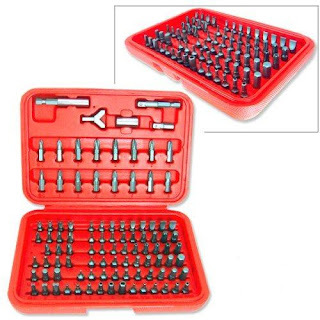 Drillbitwarehouse.com has the original 100 piece security bit set. It comes complete with 100 bits and each bit is made from m2 high speed steel. We recently did some checking and found there are many knock offs of this set selling for much less. After testing the hardness and all-around quality we found a huge difference. The size of the bits were all over the place and many of them were so soft they were almost imposible to even use without destroying the security screws and female heads they were designed to work with. The Drill Doctor feels the best price is usually never the best value when it comes to tools these days.